The power of radio, its proximity to the population and its ease of access, provide a unique opportunity to reach the largest number of people in the shortest possible time to effectively disseminate prevention messages during sanitary crises and epidemics. 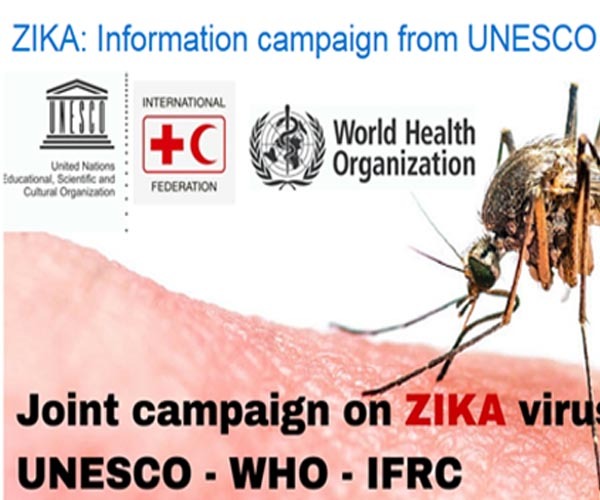 Three information and prevention radio spots against the spread of the Zika virus were produced by UNESCO in collaboration with the International Federation of Red Cross and Red Crescent Societies (IFRC) and the World Health Organization (WHO) in the four major languages of the region: English, French, Portuguese, and Spanish. Spot 1: "Zika, protection from vector" provides general information and effective measures to respect, to protect oneself his community. It is a general mobilization message. Spot 2: "Protect pregnant women" aims to educate pregnant women about the specific risks of Zika virus. The virus is transmitted from mother to child, so it is important to protect especially pregnant women. This is everyone's concern, not just women. Spot 3: "Zika, avoiding rumors" aims to propagate real and valid information about the virus and risks. This is to dispel the rumors and not to let settle panic atmosphere in communities. Leading international broadcasting networks and organizations - such as the International Association of Broadcasters (AIR-IAB), the Caribbean Broadcasters Union (CBU), Radio France Internationale (RFI) and the World Association of Community Broadcasters (AMARC) among others - have advertised, distributed and broadcasted the spots. Every UNESCO Member States’ National Commission from the Latin American and Caribbean region was also involved, namely 36 countries. In total, the campaign reached nearly 20,000 radio stations throughout the whole American continent.